We don't really have a school room, per se. We live in a fairly small condo, so where we do school is anywhere from our coffee/kitchen/patio tables to the beach. But I do invite you to figuratively step in to our school room and see a little bit about what we're about and what school looks like for us. In the fall of 2016 we have a 4th-grader (Gigi), a 1st-grader (Brody), and a kindergartener (Hallee) in the house. Our kids are enrolled in a public charter school, which offers classes at a learning center two days a week. 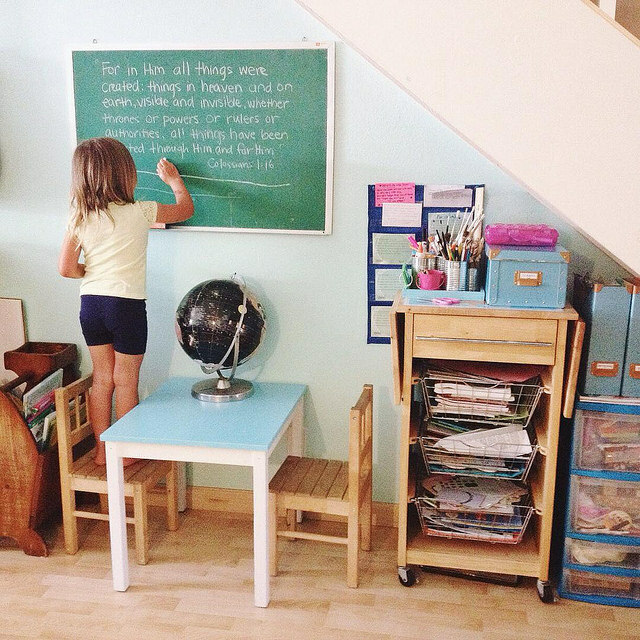 So essentially, we are a part-time homeschooling family-- at home three days a week. We philosophically lean towards a classical-style education but we are beginning to pull a bit from Charlotte Mason and other philosophies as well as we settle into our homeschool identity. Things change frequently too, which is one of the things I love about the way we are educating our children. I can customize as we go, and now, fours years in, things are a lot different then they were when Gigi first started. We love to read, we're learning to nature journal, we love language, and we struggle a bit with math. We're a work in progress, leaning on grace, striving for wisdom and virtue, and looking for beauty all around us. We like to play and have fun, love being outside; we're working on being more disciplined, and through it all, trying to love God and love one another. Subscribe to homeschool posts by clicking here.